This was my year to turn the "big" 3-0. Previous years have found us celebrating St. Patrick's Day with the revelers in St. Paul, but this year felt different. This March found me in the final months of preparing for Baby #2 and dealing with the toddler antics of C (aka Baby #1). On top of that, the days prior to my birthday were spent hosting a dozen family members. Needless to say, my attentions really weren't on myself. God, however, orchestrated a *wonderful* 30th birthday; I couldn't have planned it better. As stated, the weekend before my birthday we hosted a dozen family members. It was *so* much fun having them all here. A few of them slept in hotels, which meant C and her 5-year-old cousin got to hang out at the pool! We'd never been to a kiddie pool before and C *loved* it. She fell into the water a few times the first day but didn't seem to mind "swimming" one bit. We also made a colossal cake in honor of the milestone birthday gals present. It was "Heaven and Hell Cake," made of devil's food, angel food, peanut butter mousse and covered in milk chocolate ganache. Very rich, dirties a lot of dishes in the making, but still worth it for a special event. Somehow I never managed to get a picture of it sliced, so you'll have to use your imagination or visit the link. 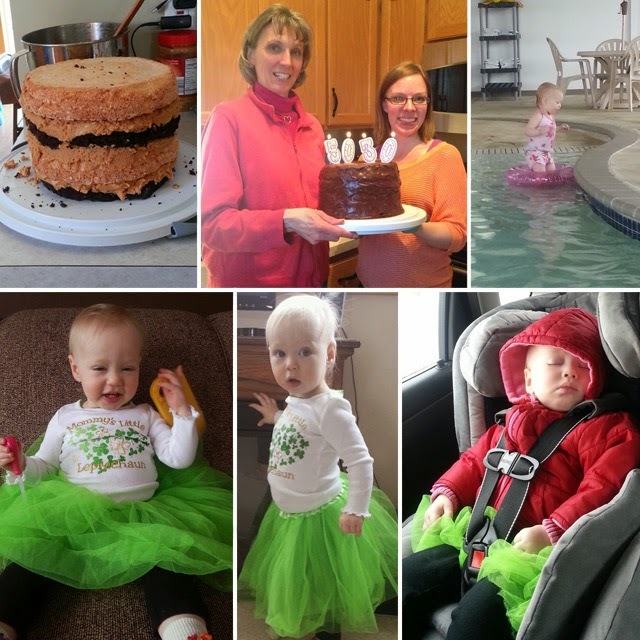 The day of my birthday I dressed C up in her best green tutu and met friends + the hubs at a restaurant for lunch. C was so exhausted from the weekend! That evening Grandpa & Grandma took over while my husband and I went on a special date to Piccolo. 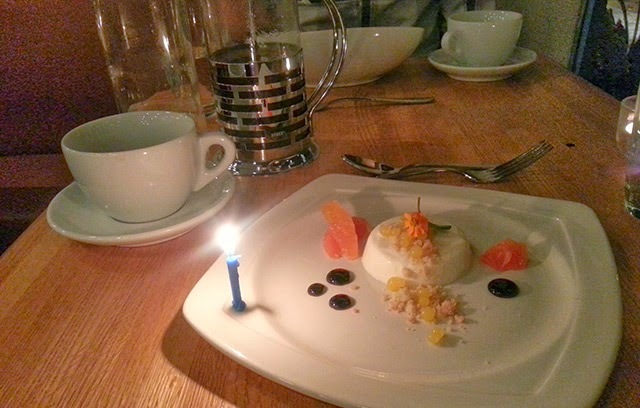 He told them in advance that it was my birthday, so I got lots of "Happy Birthday" wishes and a special card and + candle with my dessert course. It was the perfect, relaxing end to the day. The rest of the week organically developed into getting together with a variety of friends, some who live far away and some whom I haven't seen in too long. Though the visits may not have been planned around my birthday, I counted them as birthday blessings nonetheless. All in all, being 30 really isn't so bad. Feels kind of good, actually!